One doesn’t listen to a bvdub album as much as one experiences a bvdub album. Brock Van Wey’s releases tend to be expansive in sound and generous in length. Explosions in Slow Motion fills four sides of vinyl and at 77:32, pushes the edge of the CD. The LP contains four tracks, each over a quarter hour in length, and four interludes, each under three. But set aside some time, as this album is best enjoyed in an uninterrupted flow. One would be hard-pressed to notice when the tracks change; they blend like segments of a stream. There are also many types of bvdub albums, some honoring the name with dub, others more electronic, others veering into techno or modern composition. This one (despite the semantic reminder of Explosions in the Sky) leans more toward ambience: an uncluttered home furnished with piano and strings. The time-stretched vocals of former releases are kept to a minimum, discernible yet shy. The mood is melancholic, like the resignation one feels after a loss has sunk in. The tonal shift from warm to chill is literal as well; this reflects a relocation from California to Warsaw. Van Wey has done this before (former destination: China), but not to this extent. The impetus was political (see the liner notes for Heartless), as times are particularly rough in the United States right now. While there are problems all over, a change of scenery can always be helpful. The combination of physical withdrawal and an icy winter has inspired one of the artist’s most introspective albums. The cold swirls outside and in. And yet, thanks to the interludes, this sprawling album yields great consistency. The strings of “Ember 1” echo of those found in the opening track, while the surge of “Ember 2” provides a reflection of the explosion hinted at in the title track. “Slow motion” is an apt descriptor, as nothing here happens very fast; even the shift from a three-note techno motif to a piano and string-drenched finale happens without fanfare, and those notes continue to swirl for quite some time. While other bvdub albums have conjured emotion, this one delves into thought. What am I doing on this planet? How shall I respond to the events around me? Which is better: to engage and be angry, or to disengage and be pensive? If I write an elegy, who or what shall it be for? The Warsaw winter calls these thoughts into such sharp relief; the end of the album seems like soft replenishment. As n5MD remains in Oakland, this means bvdub has moved away, but sent something beautiful back. In this mourning, there is remembrance, and remembrance produces strength. Thanks so much for the beautiful review, and even more beautiful support. You guys help keep me going when it’s so easy to let it all go. Definitely right about one thing… I think it’s tough times for everyone everywhere. Best to all and stay strong! You’re welcome, Brock. You bring up a great point that we often overlook: music is in the ear of the beholder. 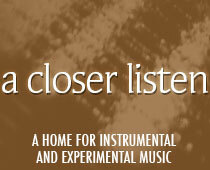 We listen to music ~ especially instrumental music ~ through a lens of experience that colors our interpretation. As the reviewer, I misinterpreted the “turbulent times of your native California home” from the press release ~ but I didn’t misinterpret my own reaction, which was to feel peace in turbulent times. So we all win. 🙂 We appreciate the contact and hope you are enjoying your new home! Like I said, that’s the beauty of music – it’s all open to your own interpretation from your own experience, which lets original impetus and interpreted intent merge as one. Well I guess you said it too haha… your own reaction can never really be misinterpreted, and agreed, we all win 🙂 Once again everything you do is deeply appreciated, not just for me and my tiny corner of it all, but for music itself. I think we can all agree we need it more than ever, no matter what meaning or form it takes. The way I use this site is I often read a single sentence of a review and then start the music and play it while reading. Now with just a short track available from a relatively long album, I listened with the lens/filter of the review and then found differing/parallel/contradictory ideas below and a second listen seems to open possibilities of listening with both sets of ideas. Now before I sound as if I am a very passive listener, I should ad that one of my favourite games is to add other music to scenes from films… last week a classical station asked how much Tan Dun’s soundtrack added to a fight scene from Crouching Tiger, Hidden Dragon and I tried it with Eye Of The Tiger. THAT soundtrack would have made a very different film… oh, back to this; second… third time through and it meshed with the sound of the ocean through the windows (Central Queensland summer, coming up to 11pm and around 26C) and was a perfect fit swelling, breathing. A sort of semi-Cageian amalgam, certainly not listening in silence. Thanks Dave, it’s always our hope that readers listen while reading because in the end, words may describe or enhance the music, but the music speaks for itself. This calls to mind the irony of using words to describe music without words! Just as there is “no such thing as silence,” there is no such thing as “just” listening to music; it’s always part of a larger soundscape and/or mindscape. As a retired property developer and interior designer I may have come closer to dancing to architecture than most. I’d also like to say that such open, enlightened, and thoughtful discussion at any stage is incredibly refreshing, given the world’s trend toward the complete opposite. Huge respect and appreciation for anyone who takes the time to truly listen, truly express, and truly feel. Thank you.